In today’s job market, it is not enough to have the proper qualifications. You must be able to list or describe them in a way that sets you apart from other applicants. We offer professional nursing resume templates to help you create a resume that accurately represents who you are and what you have accomplished. This shows hiring managers you are a worthy candidate. Look through our variety of industry-specific resume examples to find the one that best represents your personality in a professional and attention-grabbing format. Once you’ve nailed down a format, you can start plugging the most convincing information into each section of your resume. Why Use Professional Nursing Resume Templates? To make sure you avoid these resume-writing pitfalls, use our professional nursing resume templates to get it right the first time. Don’t let your resume get passed over because of design issues when we have put many correct options at your fingertips! When you need your resume to be easily read and understood with only a short glance, consider using a modern template. Our samples can entice employers looking for candidates who are both professional and willing to take a few risks. See how unique and bold your resume can look when you use one of our modern resume templates. In a time-sensitive industry, don’t waste a hiring manager’s time by writing a long resume. There are many things you can cut out of your resume. Use one of our one-page professional nursing resume templates to write such an appealing shorter resume they will want to contact you for more information. Check out all our shorter versions here. In an older industry, it can be respectful to use a well-established resume format. These widely recognized professional nursing resume templates organize your information in a standard way, making it easy to read. 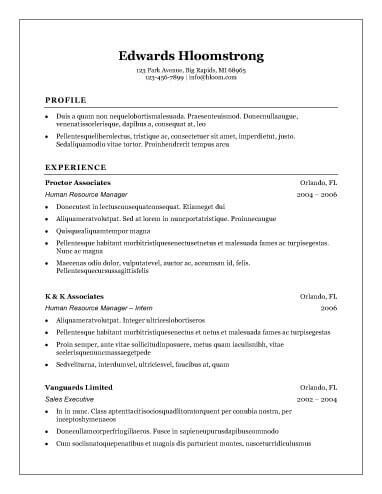 You can play with the font size a bit to personalize your resume. Look through all the styles available in our collection of basic templates. The medical field can be competitive. When you need your resume to jump out at a hiring manager, it may be time to get inspired by one of the professional nursing resume templates in our selection of creative templates. They can assist you in being different without seeming too wild. Some resume formats have become well-liked by writers and readers alike for their data structure. They showcase the most important information and allow you to express your personality. Using one of our widely beloved resume templates can give you confidence that your resume will be well received by hiring managers. As you construct your resume, it is important to keep it concise and only include relevant information. While our professional nursing resume templates can help you limit the length of each section, it is up to you to choose your words carefully. Read through our resume writing tips to make sure you include the following sections. Full Name: It is unprofessional to list a nickname. Use your full legal name instead. Professional email address: If your personal email address is something you find amusing or cute, it is usually best to get a new one to list on your resume that is more generic, like a combination of your first and last name. Phone number: It is best to list a cell phone number where you can be easily reached. Only list a work number if you have no other options. Mailing address: It is only necessary to list the city and state you currently live in rather than a house number and street name. Your opening statement can speak volumes about your personality and goals. Choose the type of statement best suited for your purposes. Objective Statement: This type of statement explains why getting this job will benefit you. It is best used by recent graduates, those switching career fields, or entry-level applicants. A strong objective statement can demonstrate your motivation to succeed in a new industry. Summary Statement: Best kept at three sentences or bullets, a summary statement gives a brief overview of your professional worth. You can use this section to list your most impressive skills or accomplishments as well as to convey the value you would bring to a company. Use the information in the job posting to make sure you keep your information relevant to the requirements of the new position. Read: Look over the job posting carefully and mimic the language used to show you possess the abilities they are looking for. Customize: Write a separate skills section for each company you apply to, as they will all have different expectations for the role. Position: Provide all former job titles, which companies you worked for, and the dates you worked there. Academics: List any earned degrees in addition to the universities you attended and the dates you studied there.